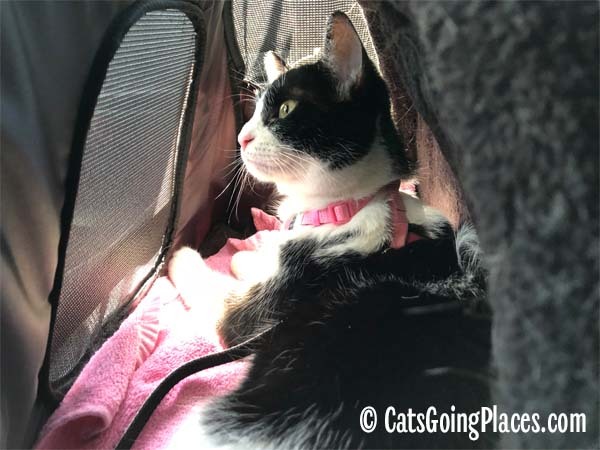 Cupcake started riding in the Gen7Pets Carry-Me Sleeper Carrier shortly after we got back from our recent trip to Kansas City. She was reluctant to go into the carrier that she probably associated with the noisy airplane ride, so I opted to try something new. I had no idea how much she would like it! 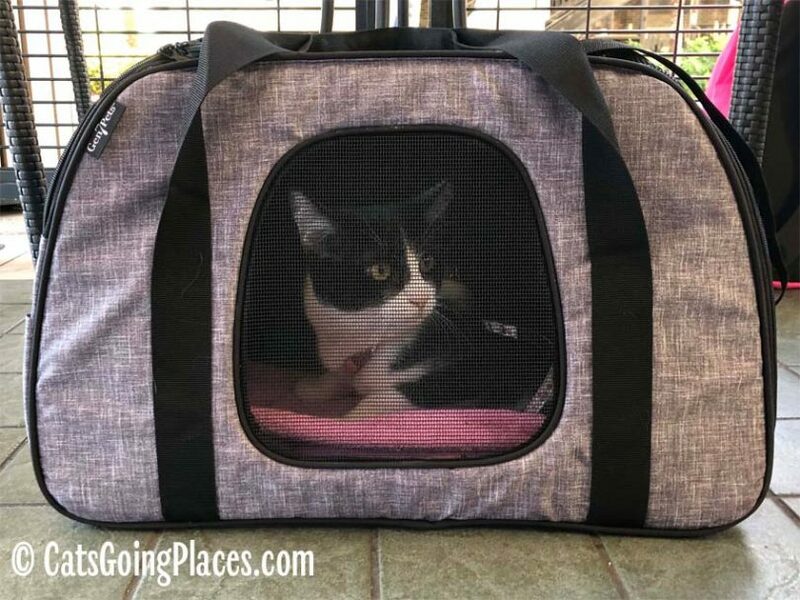 Unlike the carrier she used for our previous trip, the Gen7Pets Carry-Me Sleeper has windows everywhere. Well, not literally everywhere, but on both ends, one side, and the entire top. 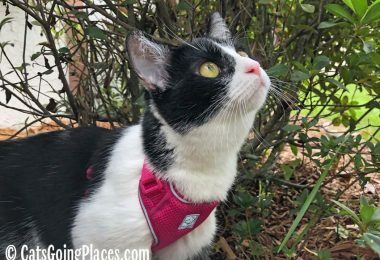 Cupcake really likes the wide mesh and easy visibility. 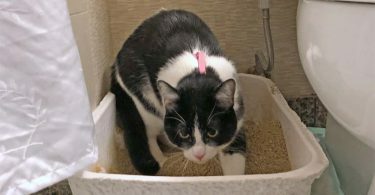 In the past, she would usually complain for a moment before settling down in the car. Now she doesn’t complain at all. The disadvantage to really fine mesh is that a cat determined to claw out of this carrier would probably be able to. Cupcake hasn’t given the first thought to staging a breakout. She is clearly relaxed during the car ride in the Carry-Me Sleeper. Having the entire top of the carrier mesh means it can let in a lot of sun. 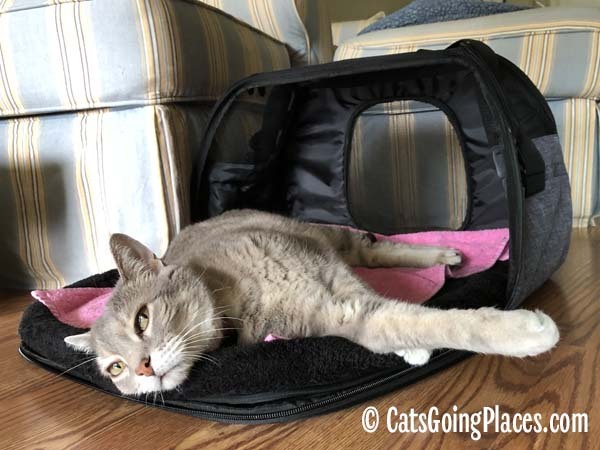 Always be aware of how much sun is getting into a cat carrier and that a cat can’t get out of it if they become uncomfortable. I recommend having a towel or something handy to toss over the top if this carrier to cover the mesh, especially if the carrier is seat belted into the sunny side of the car. 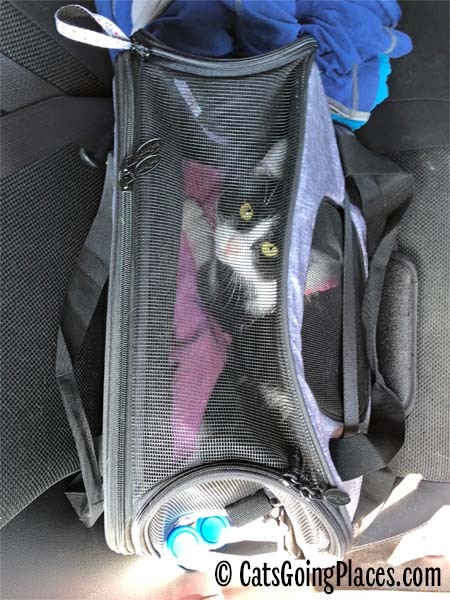 Speaking of seat belting, you have to be careful not to pull the seat belt too tight on this carrier or it kind of crumples, leaving less room for the cat inside. 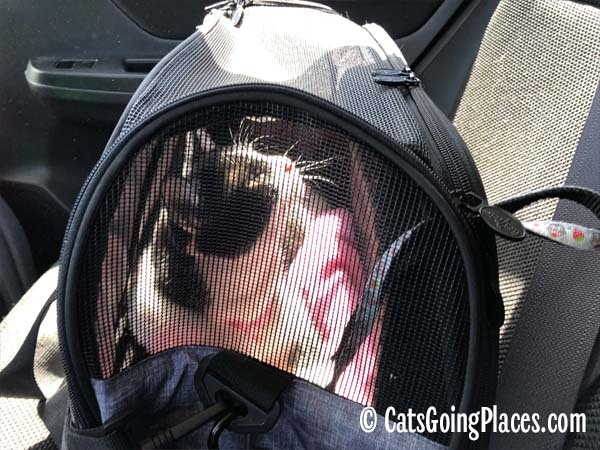 Cupcake was not amused when I clicked the seat belt in and gave it a hard yank like I usually do only to have her lose some of her space inside the carrier. You can see in the photo above that the end of the Carry-Me Sleeper isn’t as flat as it would be when the carrier was just sitting in the living room. I think this happened because the carrier’s end structure is held up by a sturdy rib that makes an arc all the way around the edges of the zip-down door. It lets the carrier itself be super-lightweight, which I love. It also means it’s easier to mush the top of the 13″ tall carrier down a bit if you have to slide it into a confined space, like under an airplane seat. The carrier is a little large for some airlines, at 20″ long, 9″ wide, and 13″ tall, so be sure to check with your airline before using it. 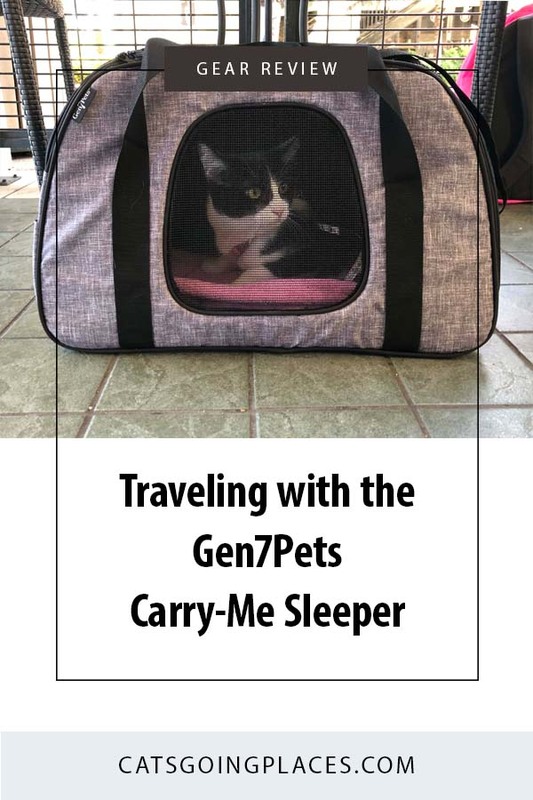 Gen7Pets says the Carry-Me Sleeper is for pets up to 20 lb. Cupcake weighs under 9 lbs, and she has plenty of room to spare. A cat quite a bit bigger than she is would fit comfortably, maybe up to 15 lbs. I think a 20 lb cat would feel cramped, but a shorter-bodied dog in that weight range would probably be fine. The Carry-Me Sleeper carrier has pockets on both ends of the carrier to help you carry small items with you. One end has a pair of side-by-side mesh pickets. The other end has a single pocket made of the same fabric as the exterior of the carrier. This single pocket goes the whole width of the end of the carrier, but it has a little section at the middle stitched shut. I guess this stitching prevents the pocket from gaping open, but it makes it difficult to use the pocket for larger items that need more of an opening. Either way, I use the end pocket for a couple vials of Cupcake’s treats so they are close at hand and keep any bigger objects in my backpack. The “sleeper” part of the Gen7Pets Carry-Me Sleeper carrier has to do with how one side of the carrier unzips and folds down to make a plush bed. It’s like the Murphy bed of cat carriers! 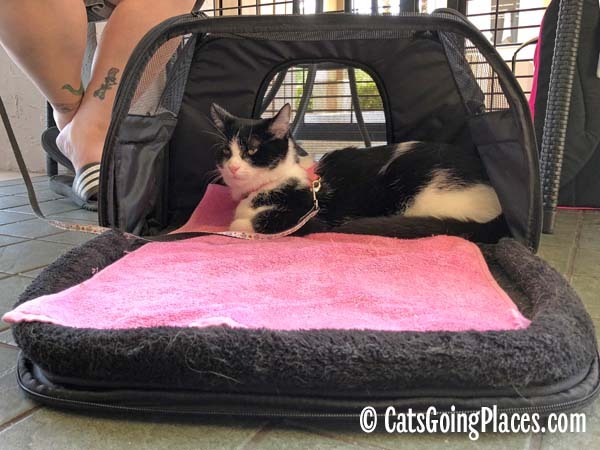 Since the interior of the carrier is black and Cupcake’s whole underside is white, I keep a hand towel in the bottom of the carrier and stretch it out over the bed section wherever we go to try to keep it looking a little less furry. The photo above isn’t just a trick of the angle. The space in sleeper mode is really big, forming a 20″ wide by 21″ deep bed. 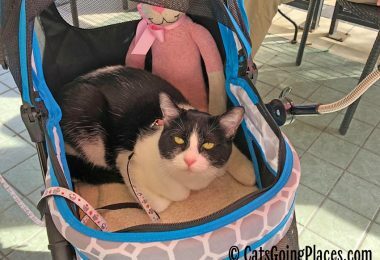 Cupcake likes having the bed open when we are sitting on the coffee shop patio so she go in and out of the carrier whenever she wants. I’m still trying to find a way to fit it under our table so it doesn’t extend too far into the aisle between tables so she doesn’t accidentally trip another patron. That isn’t a shortcoming of the carrier, though. Its large footprint in sleeper mode is a good thing from a cat’s perspective. As a matter of fact, when I leave the Carry-Me Sleeper carrier open in my living room, it is a preferred bed. My other cats, who aren’t at all inclined to travel, choose to use for a snooze instead of their other beds. 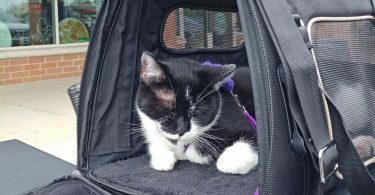 The Gen7Pets Carry-Me Sleeper carrier is a cleverly designed carrier for the cat on the go. 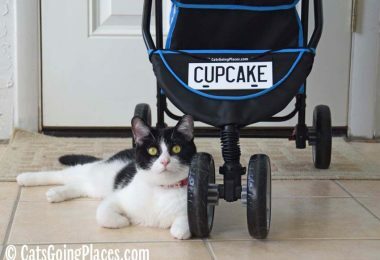 Cupcake and Pierre both give it paws up, and so do I for its light weight and ease of use. You can purchase the Gen7Pets Carry-Me Sleeper carrier from Amazon (affiliate link).  FTC Disclosure: I received our Gen7Pets Carry-Me Sleeper carrier at no charge. This didn’t influence what I said about the product. All opinions in this review are my own and not influenced by any outsider. I receive no additional benefits for talking about the products or company.